The old TV Show Streets of San Francisco was famous for cars speeding up and down the streets, jumping over the typical steep ups and downs of the roads in this world famous city. It was exciting to watch and drew in viewers. The people who watched that show loved it because it was a side of San Francsico they couldn’t understand and for most they didn’t know what it would take to even come close to doing stunts like that. 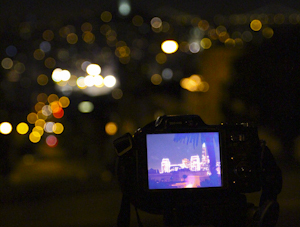 Night Photography is a lot like the Streets of San Francisco. Many people oooh and ahhh over what they see, but many don’t understand for feel doing photography like that is beyond them. Lucky for photographers The Aperture Academy are the stunt drivers of photography education. 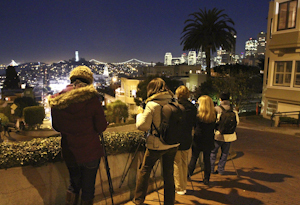 We help provide students with a safe, fun, and educational environment that lets them explore the world of night photography and leave with more information than they came in with….and like the TV show…it takes place in the Streets of San Francisco. 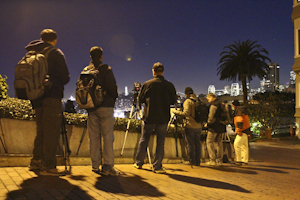 A eager group of thirteen students met professional photographers Brian Rueb and Ellie Stone, at Baker Beach under a dark sky to go over the introductions and get a feel for what their night in the city would entail. Everyone introduced themselves, and let the instructors know what they wanted to work on during the evening, their skill level, and the type of gear they used. The insturctors like to know where each student is in their journey with photography so they can tailor instruction to their personal learning styles and needs. 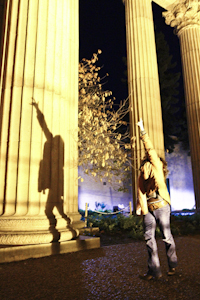 The evening began in the wonderfully created Palace of Fine Arts. This throwback from the time when buildings were made to suit a purpose and look amazing is a great place to discuss all the options available to night photography. 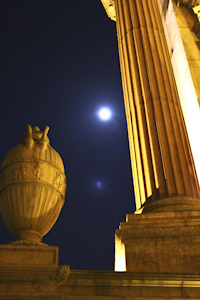 Composition to include or exclude reflection, ISO, White balance, and most importantly exposure. Exposures at night are tricky. Combing just the right shutter speeds and f-stops takes practice. The instructors helped the students read their histograms and offered sugesstions on how to best expose this tricky high contrast scene. From the outside of the building to the inside of the dome the class made great use of all the symmetry and interesting shapes the location had to offer. Whether it was larger wide angle shots, or more intimate details of the interesting lines and shapes the class really worked hard to come up with unique images, and certainly succeeded on many occassions. 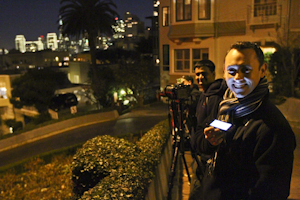 The second location for the night was the famous crooked portion of Lombard Street. Just the type of location someone in The Streets of San Francisco would jump over. Our class opted for a safer approach and simply walked to the desired locations where Brian and Ellie worked with the class on exposing for creating movement with the cars that slowly worked their way down this narrow section of road. The blur of the car lights created very interesting ‘S’ curves that worked to lead the viewers eye through the composition. Brian showed many of the students secret ways to use their hats or gloves to prevent over exposing the bright headlights as they worked their way down the street. The students are always excitied to see the compostions they come away with when they shoot Lombard street. Many have only dreamed of being able to capture images like the ones that were appearing on their screen. With some quality instruction and practice the students were beginning to piece together the mystery of night photography. 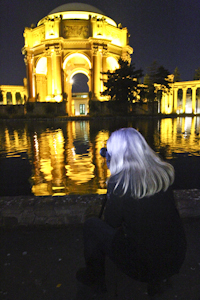 With the first two stops of the night complete it was time for a short break in the bustling center of SF nightlife, North Beach. We stop at a nice little Italian Deli fo rthe students to grab a sandwhich or coffee and get back a little of the energy and warmth they’d lost over the first portion of our chilly night in the city. 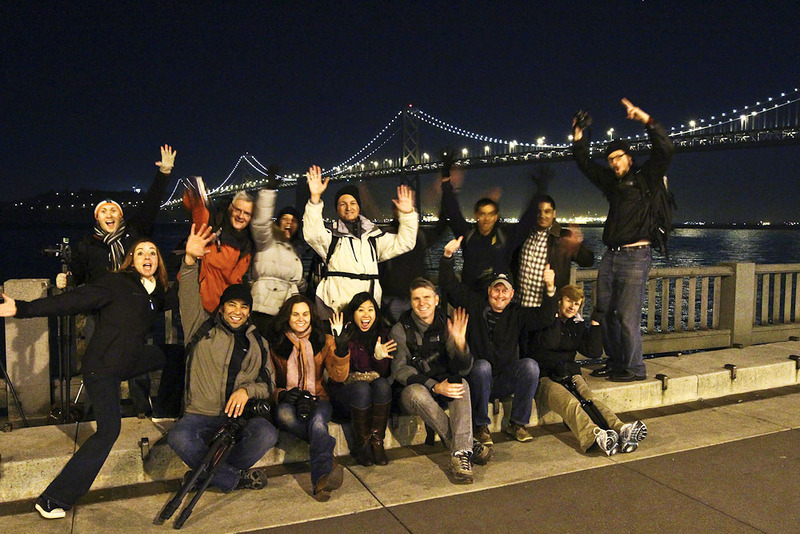 The last stop is the iconic Bay Bridge and the view from Embaracdero. The class loves this shot as it’s often seen in the gallery and in numerous other locations. We use the old bridge pilings in the bay as a foreground point of interest to balance the compositions and create more aesthetic images. The class also focused on playing with their white balance settings to see how different white balances can change the mood of an image for better, and worse. Brian took a portion of the class down the Embarcadero a bit to work on some different compositions using an old fire boat as another form of interest in the compositions. The boat moves so it was a good way to show how increasing ISO and using a smaller f-stop would allow for shutter speeds that were able to capture the boat sharper than the really long exposures we had been using on the bridge and pilings, where all the parts of the image were stationary. It was a great location the end on and the students left with drained batteries and full memory cards. While we never could get the van to really jump ala Streets of San Francisco, our cautious appraoch was far more condusive for photography. Brian, Ellie, and the rest of the Aperture Academy Team.